U.S President Trump revoked the security clearance of former CIA Director John Brennan. Besides that, there is no sound reason why anyone who does not work for the government, directly or indirectly, should have a clearance and thereby access to state secrets. ACLU and others are wrong in this. Revoking or keeping a security clearance has nothing to do with free speech or first amendment rights. Most important was “Brennan’s ringleader role in the so-far unsuccessful attempts to derail Trump, both before and after the 2016 election. 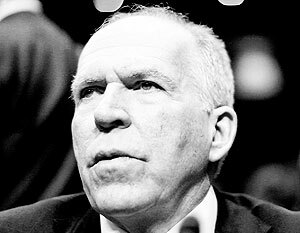 As far as we can tell it was Brennan who concocted and launched the conspiracy to insinuate that Trump is connected with alleged Russian influence. Brennan bets that Hillary Clinton would win the election. He lost his bet and is now out in the cold. He fears that his role, especially his conspiring with British security services and with the Steele dossier, will come to light. Trump is excellent at playing his domestic opponents. Brennan made a huge mistake in publicly opposing him. He is now standing in the limelight and people will only dig further into his role in the “Russian collusion” campaign. Yesterday Brennan authored a New York Times Op-Ed headlined President Trump’s Claims of No Collusion Are Hogwash. It does not provide any evidence for the “hogwash” claim. Brennan can not show that there was a Trump campaign collusion with Russia or anyone else. It is doubtful that Trump will let go of the issue. Brennan is a too juicy target to stop shooting at it. Currently, Brennan is still too valuable as an enemy for Trump to destroy him. But once that is over Brennan’s day of judgment will come. Here are high hopes that Brennan will finally have to pay for at least one of his many crimes.